You’ve decided on getting a wooden engagement or wedding ring – but you still have a ways to go. 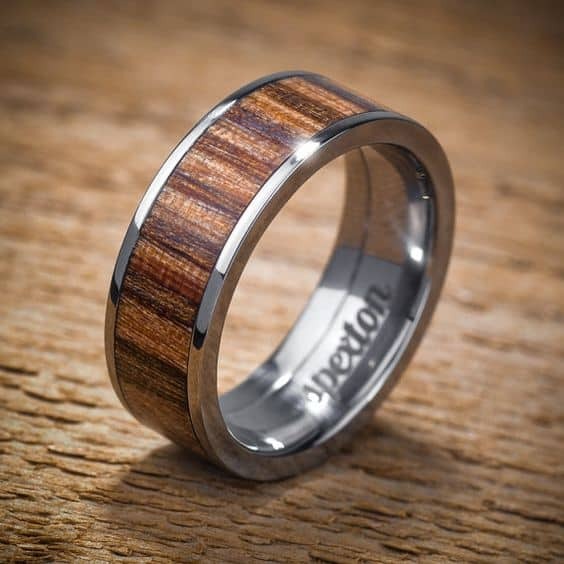 The first step is deciding on what kind of wood you’d like to use in your new ring. I’m an effort to make this decision an easier one to reach, we’ve compiled a list of the best woods for wedding and engagement rings. There are so many beautiful types of wood for rings, we had to divide this into a three part series. In this part, we look at Applewood, Birch, Bogwood, Cedar, Cherry, Chestnut, Ebony, Hackberry, and Juniper. In Part 2, we look at Kauri, Koa, Mahogany, Maple, Oak, Osage Orange, Pine, Paduk, and Pearwood. In Part 3, we look at Purple Heart, Redwood, Rosewood, Teak, Walnut, and Zebrawood. Applewood naturally comes in a beautiful warm tannish-blonde hue that is extremely agreeable to stains and polishes. 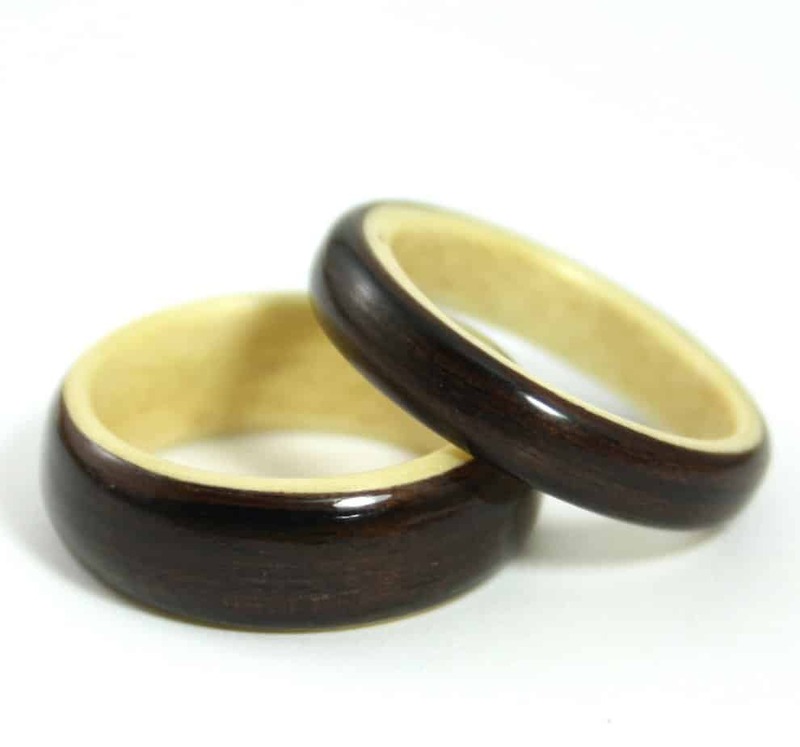 This wood has nice and even grains making for an elegant engagement or wedding ring. Applewood is a dense lumber making it resistant to everyday wear and tear. The density of applewood, however, also makes it difficult to work and the labor of creating such a ring might exceed those of a similar more workable lumber. The following video shows not an applewood ring, but a ring box made from applewood. You might agree that this is a lovely looking wood, and would make great ring material. Birch is a beautiful hardwood that naturally comes in a white/ashy gray shade with dark brown knots throughout it. This wood is one of the easiest to stain while still remaining cost effective – it is a common substitute for Maple wood. 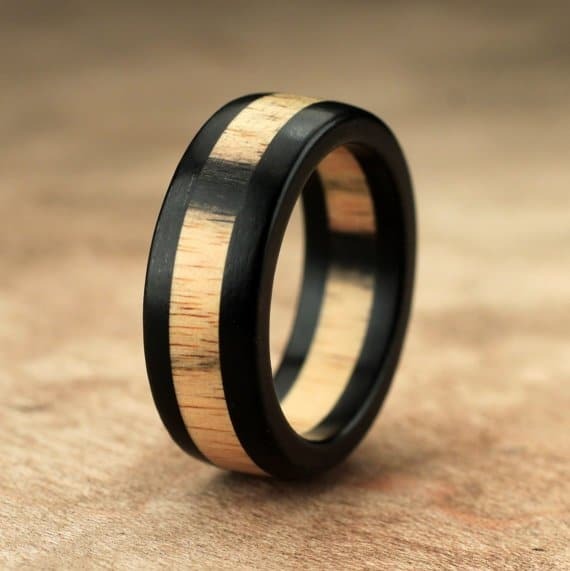 Birch wood is extremely durable and a great and inexpensive option for the wooden ring enthusiast that has a labor intensive job! 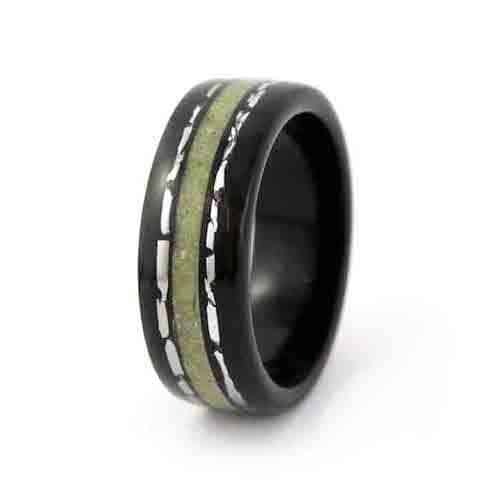 Here is an interesting video which shows the making of a birch wood ring. 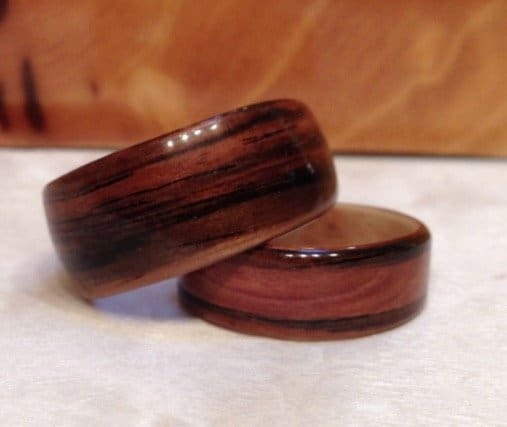 This particular ring may not be something you’d want as a wedding ring, but you can see how relatively easy the wood is to work with and the potential it has for beautiful colors and designs. Bogwood is wood that that fell into a bog and was therefore protected from atmospheric influence while continuing to age. This wood is the beginning point of wood fossilization and comes from an array of different trees. Because bogwood doesn’t come from a specific species of trees, the durability and colors will vary greatly. 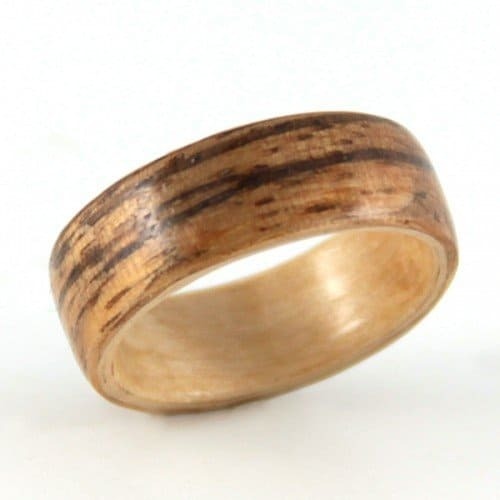 Bogwood is a great material for a bride or groom that desires a ring with rich symbolism as this wood merges the rich history of the tree from which it came to the beautiful present of the shape it has taken – it can be viewed as the wood ring equivalent of the three-stone setting found with gemstones that symbolize the past, the present and the future. Watch this video, featuring bog wood sculptures. 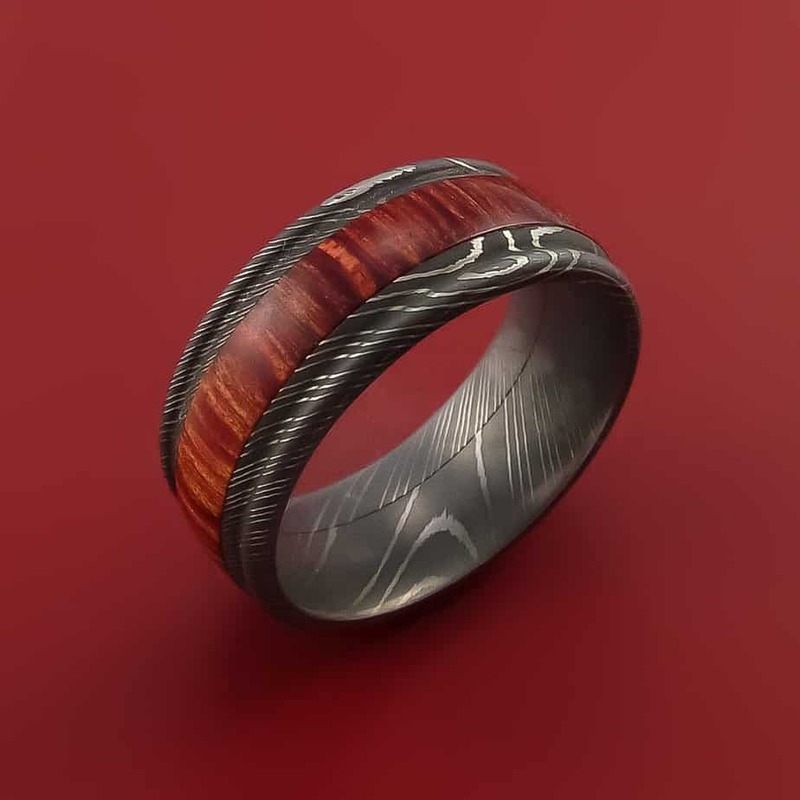 The character and color in some of this wood is certainly amazing, and you can see why it can make such a unique ring material. Cedar wood is a wood with a naturally yellow tint that can be easily stained and primed, though it shouldn’t be because as it ages, this wood takes on a stunning gray and silver hue that is truly one of a kind! Cedar wood makes for a wonderful material for a wedding or engagement ring due to its easy workability and high durability. Cedar is also extremely an extremely affordable wood that required very little maintenance, making it an ideal option for the low-key bride or groom. Take a look at this video which shows cedar wood up close. Although not in ring form, you will get a good idea of some of the colors you might expect to see. Cherry wood finds its popularity in its naturally beautiful shades. Although cherry wood ranges widely in color, and can be found in any shade from a dark burgundy to a pale white, many still find it necessary to stain this beautiful wood. Staining cherry wood is highly advised against as the wood doesn’t take stain evenly and the results can be splotchy. Cherry wood is one of the easier hardwoods to bend, allowing for more versatility in design, but it should also be noted that this species of wood is easily dented and costs more than many other hardwoods so it isn’t an ideal candidate for those that undergo strenuous work with their hands. To get a closer look at cherry wood as it is being transformed into lumber. 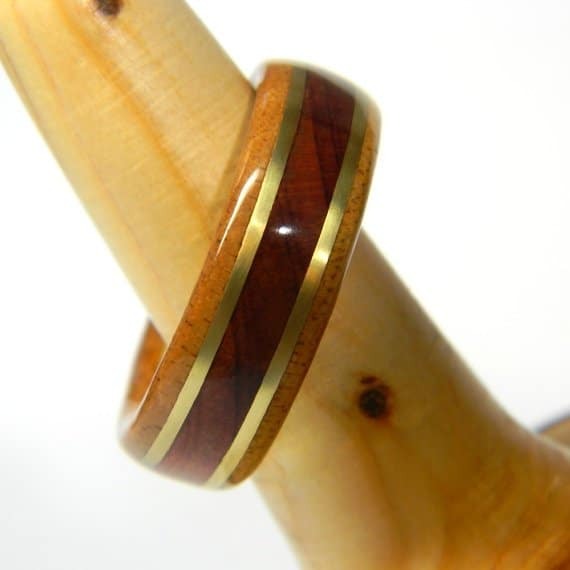 Some of the hues in cherry wood are part of why people love them in the form of rings. For the purpose of wedding and engagement rings, there are two types of chestnut woods that are important to note. The first is heartwood – when harvested, heartwood takes on a light to medium brown tone which then darkens with age and transforms into a beautiful dark brown piece. The second is Sapwood – which unlike heartwood, is a light brown wood that can even be found in white, and retains its color with proper care and treatment. 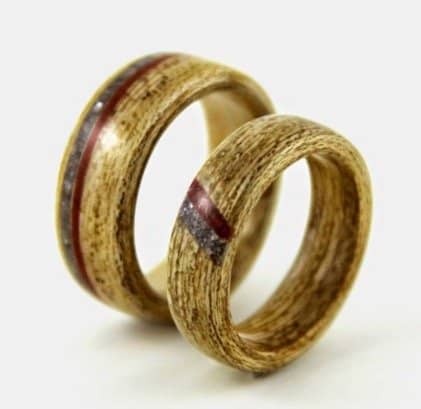 Both types of chestnut woods are extremely workable and are agreeable to stains and finishes, making them a perfect candidate for a custom and rustic wedding or engagement band. Unfortunately, due to the chestnut blight of the 1990’s, an era where thousands of chestnut trees caught a deadly disease that demanded for them to be cut down, chestnut wood is rare and expensive today. To find out more about chestnut wood, here is a slightly long but interesting video which talks in detail about what happened during the Great American Chestnut blight. As one might guess from the name, ebony wood is dark and mysterious. Though it is commonly black, some forms of ebony wood can be dark brown with black markings along the grain. The trees that harvest ebony are typically grown in tropical regions and are quite small in stature – making this a difficult wood to harvest. The beauty of ebony, however, makes the wood highly desired. This combination of low quantity and high demand makes this unique exotic lumber extremely rare and very expensive to obtain. For more info on ebony wood, watch this video which talks about the rarity of the wood, its value, and also features an extremely rare log of actual ebony wood straight from Africa. Hackberry is an extremely affordable and workable lumber. Hackberry is light brown but displays hints of grey within its grain. What more, hackberry that has succumbed to fungal diseases can sometimes be a bluish shade of gray, a hue that some find desirable. Hackberry is highly workable and with steam bending, can be formed to create an array of unique and intricate designs. Unfortunately, as many redeeming characteristics as this wood has, it isn’t a durable wood and would have to be carefully looked after if used for the purpose of a wedding or engagement ring. For more of a look at hackberry up close, take a look at this beautiful hackberry bowl made by Cip’s Wood Chips. Towards the end of the video you can start to see some of the amazing textures and colors. Juniper is an extremely versatile stone that varies extensively in color – juniper wood could come in shades of dark brown and it could also come in shades as pale as white, making it a valuable asset to a bride or groom that like variety. Juniper is a softwood and can be dented with ease so it should be treated with extreme care. Though it’s fragility is unfortunate, it lends to the woods pliability – in the right conditions, Juniper can be bent to the point of tying into a knock without any damage to the wood – this affords a bride or groom seeking a unique ring a lot of room for personalization in design. Here is a video showing a sculpture made from Juniper wood – a dragon. As you can see, Juniper is a beautiful wood to create things from, with a soft flowing nature and great highlights and colors. Thanks for reading. Click here for Part 2.